When a local magician Yamada Naoko (Nakama Yukie) gets fired from her job due to not being able to attract customers, she feels all hope is lost. 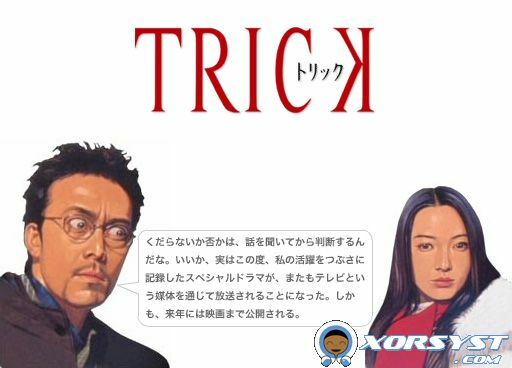 Her boss feels a bit bad and gives her a newspaper article by physics professor Ueda (Abe Hiroshi) claiming money to whoever can prove to him that magic is real. Yamada decides to take his challenge, and impresses him with simple slight of hand. Ueda becomes convinced that she is the real thing, and tells Yamada the real reason why he placed that advertisement. There is a local cult run by someone called “Big Mama” that is linked to murder and brain-washing the local population. Ueda is convinced that Big Mama is a fake, and must be discredited. D-Addicts.com describes this series as being like “mysteries, all with tricks needing to be solved in sort of an X-Files meets Scooby-Doo”. I would have to agree. This series is really funny and cleaver at the same time. I’m sure you will enjoy this one. Check out the Season 1 from Tokyo Toshokan.